Item Name: 021-1368 ABC 123 Quilt Blocks Stamped X.S. ABC 123 QUILT BLOCKS. 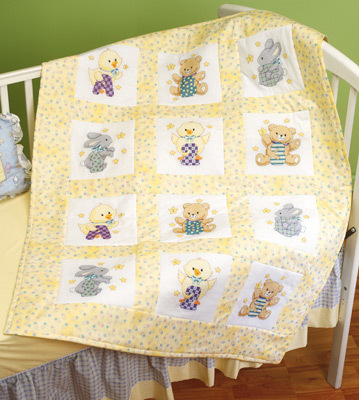 Make an adorable quilt for baby with our stamped Quilt Blocks. Design features animals and chickadees with the letters A, B, C and numbers 1, 2, 3 pre-stamped on broadcloth squares. Assemble with floss and finishing fabric colors of your choice. Kit contains: 12 screen- printed 9" x 9" 50/50 polyester/ cotton broadcloth blocks, needle, graph, andmulti-lingual instructions . Floss not included.